Friendly mom-and-pops, historic Hawaiian homes, and small close-knit neighborhoods are what make Manoa the charming, and welcoming community that it is. Established around the academic centers of Punahou School and University of Hawaii, Manoa has always been a both serene place of immense natural beauty, and also a prestigious community where many of the founding missionaries made their homes and schools. While many of the streets in Manoa were designed before the concept of a 2-way road existed, its quaint, historic feel is what makes it a fantastic community for families and academics alike. Manoa is actually situated in a valley that boasts beautiful mountain views, cool temperatures, and higher than average rainfall. 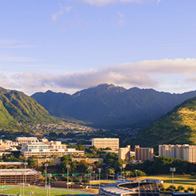 Manoa is especially convenient to Downtown Honolulu, as well as Waikiki and Ala Moana Shopping Center. With close freeway access, Manoa makes for an easy commute to just about anywhere on the island. The convenience and charm of Manoa is not lost on the real estate market, homes in Manoa are some of the most desirable on the island, and often go at competitive prices. Buyers need to be ready to move when the right home comes onto the market. For More Information on Manoa Real Estate, contact our Manoa Specialist or call 808.971.7711.